In honour of Movember, the campaign for men’s health, I give you Herbert J. Bowman, who certainly knew how to wear a moustache with grace and style. Herbert Joseph Bowman was born on 18 June 1865 in Berlin, Ontario, the son of Israel D. Bowman and Angeline Louisa Tyson. He studied at the University of Toronto and graduated in Civil Engineering in 1885. During his final year of university, Bowman joined the Queen’s Own Rifles and took part in the suppression of the Riel Rebellion. He later became a member of the 29th Regiment of Waterloo County, and served as its Commanding Officer. Herbert apprenticed as a land surveyor with Peter Silas Gibson and passed his final exam on 7 January 1887. He qualified as a Dominion Land Surveyor and practiced as a land surveyor and civil engineer in Berlin, Ontario. He was responsible for the design of Berlin’s sewer system, including sewage disposal works. He was also interested in the Good Roads Movement. 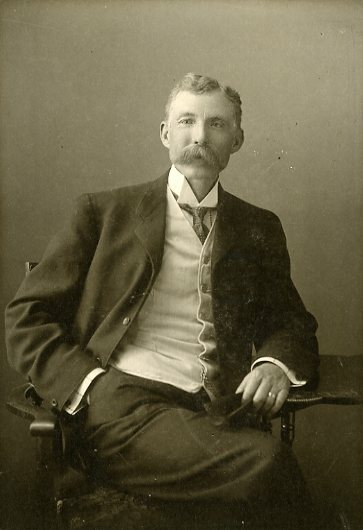 Elected in 1899 as a City Waterworks Commissioner, Herbert also served as County Clerk from 1896 to 1916, in the footsteps of his father, Israel Bowman. He was also the Inspector of County Roads and the House of Refuge. Upon the outbreak of World War One, Col. Bowman organized the 108th Militia Regiment and was its Commanding Officer. This regiment supplied most of the officers and over two hundred and fifty men to the 118th Overseas Battalion. A Liberal in politics, Bowman was also a member of First Church of Christ Scientist. He was married to Edith Walker in 1889 and they raised four children: Hope, Ruth, Victor and Ernest. He died on 19 June 1916 after a prolonged illness and was buried at Mount Hope Cemetery. A dapper man with a fine record public service.